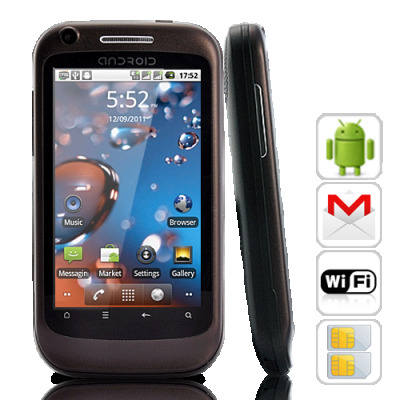 Successfully Added Cocoa - Dual SIM Android 2.2 Phone with 3.2 Inch Touchscreen (WiFi, Quadband) to your Shopping Cart. Join the Android family with this affordable new Android Smartphone. Featuring dual SIM slots, Android 2.2, and a clean beautiful design with tons of cool features, the Cocoa smartphone will make your first Android experience unforgettable. Portable convenience with tons of features: If you don’t want another bulky large smartphone, than this one is perfect for you. The Cocoa smartphone comes with a nifty 3.2 inch screen making it slightly smaller than most other Android smartphones on the market, yet at the same time, maintains the clarity and viewing pleasure. A smaller phone weighs less, fits better in your hands and most importantly, saves power consumption so your battery can last for longer hours. The Cocoa smartphone keeps you connected: Android, the world's most popular mobile operating system, merges everything into one, making it easier for you to stay connected. Your personal and work emails, contacts, calendars, social media - all are in one interface and one mobile phone. Upload and share photos so all the world can see your photos be it Facebook, Twitter, Gmail or MMS. With the Cocoa smartphone, you can stay in contact with friends, business partners, clients, family members wherever you are. The Android Marketplace: Apps for work, convenience, and fun: With the flick of a finger you get access to the famous and versatile Android Marketplace, home to hundreds of thousands of useful and fun applications. Install everything from the latest and most popular games like Angry Birds and Paradise Island, to the new and innovative application tools that will help make your life more convenient and efficient. Cool, stylish and fully packed with features that make your life easier, the Cocoa smartphone is now offered at an irresistible wholesale price from Chinavasion, it’s the best opportunity to buy wholesale stock and sell to profit. Order today and we'll ship it out to you tomorrow! Excellent, qualité/prix imbattable, je le conseil pour tous ceux qui ont 2 SIMs et un petit budget, facile d'utilisation avec androide.